others are painted in oil. Some of these original paintings include verses, others do not. There are paintings on paper and paintings on canvas. All are unique. And new paintings are added often. This lovely impressionistic oil painting on canvas was created in 2018. It sits in a 23"x 26" beautiful black and gold wooden frame. This beautiful spiritual painting is an acrylic on canvas. It is 3'x4' with a gold finish rubbed across the surface. $1,200. SOLD! If you wish to contact Sally for a similar piece, fill out the form below. Joyous dolphins dance across this canvas. This an acrylic painting is 4'x4." $1,500. SOLD! If you would like a similar painting, contact Sally on the form below. textured surface. Orange, yellow and gold rubbed into the background. 4"x6". $1,800. SOLD! This lovely ocean scene finds sailboats in the distance and beach goers on the beach. It is an acrylic painting on canvas in a golden wooden frame with the outside dimensions are 17"x20". SOLD! $1,700, plus shipping. Contact Sally below to purchase this piece. Original acrylic and ink. Outside dimensions are 18x22." White wooden frame with glass. $125, plus shipping. Contact Sally below to purchase this piece. Original acrylic on paper with ink. Outside dimensions are 12.5"x15.5". White wooden frame with glass. $85, plus shipping. Original acrylic painting on canvas. 16"x20." SOLD! Contact Sally on the form below, if you would like a similar piece. Original acrylic on paper with ink. Outside dimensions 5.75"x7.75." Deep red wooden frame with glass. contact Sally in the form below. Original acrylic on paper with ink. Outside dimensions 7.75"x7.75." In simple white frame with glass. $65, plus shipping. SOLD! If you would like a similar piece with this verse, contact Sally in the form below. "That which touches the heart touches everyone. That which touches everyone is worth everything." Original acrylic painting on paper. 16"x20." Will fit into a standard frame. $65, plus shipping. 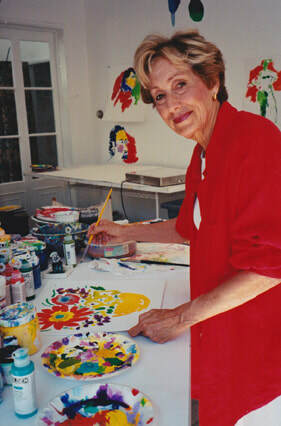 Sally in her studio in 1987.